Ever since the acquisition of Nokia in late April for $7.2 Billion, Microsoft was still launching their devices with the Nokia brand name. But this is going to be changed tomorrow. As Microsoft has confirmed that they will be launching a newer device tomorrow but it will named as the “Microsoft Lumia”, not as Nokia Lumia. This is the first smartphone of Microsoft in the Lumia series. We are not confirmed whether we will never hear the name of Nokia in Lumia series or Microsoft would still be using Nokia Lumia. Current scenario shows, Nokia is now seeing an end of Lumia series with their last release of Lumia 730 and 830. 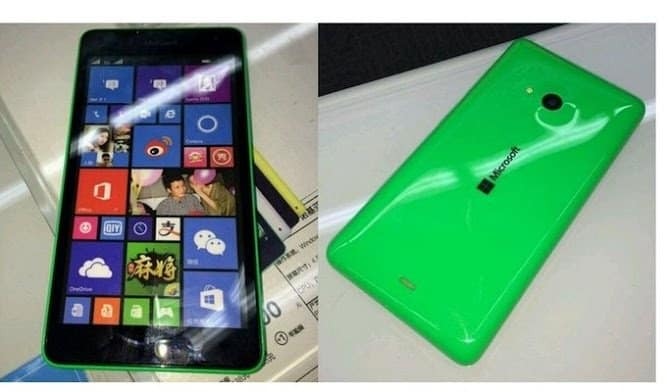 Like its predecessors, the Lumia 535 is said to be coming in White, Red and Green colors. May there be a Yellow and Blue version too. Sooner or later we will know all the details when the phone is released tomorrow. We are expecting this phone to be priced in $100 range, which might be in par with the competition Moto E, Asus Zenfone series and Xiaomi Redmi 1S in Asian Market. We recently also heard a bit of news, which has to be taken with a pinch of salt as what going to follow is not announced but leaked by external sources only. Microsoft is in early works with Lumia 940 which is a 5 inch flagship powered by Snapdragon 805 processor clocking at 2.7 GHz with 3GB RAM, 24MP primary shooter and a 5MP secondary one. Most interestingly, it’ll be running WP10 OS which as of now is unannounced and the screen will be protected with Corning’s yet to be revealed Gorilla Glass 4. So, don’t expect this monster to be launched any time soon. Come on, let us know your comments about this Microsoft Lumia 535.